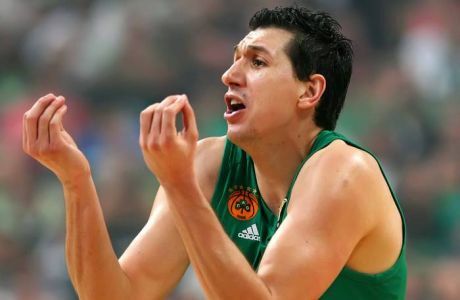 BallinEurope bets that Dimitris Diamantidis didn’t sleep too well last night. In handling the ball of the final play in Panathinaikos’ 66-64 Euroleague Final Four loss to CSKA Moscow yesterday, former MVP DD was stifled by the Red Army defense and poor PAO fans could only watch time run out on the Greens’ back-to-back title bid. Diamantidis also inadvertently helped redeem his CSKA counterpart, Milos Teodosic, an 88-plus percent free-throw shooter who could’ve iced the game with nine seconds remaining but missed both – and this after referees missed a couple of borderline dragging-the-pivot-foot travels as well. No matter, though. What everyone tweeted about immediately – and DD is surely contemplating today is what exactly happened on that last Panathinaikos possession. To check out how it unfolded, start at about 3:17 in the video below. With 8.3 seconds remaining, joining Diamantidis on the court for PAO were Saranus Jasikevicius (who had been involved in revolving-door substitution with Nick Calathes for much of the game’s last six or seven minutes), Kostas Kaimakoglou, Mike Batiste and Romain Sato. For CSKA, it was Alexey Shved, Andrey Vorontsevich, Andrei Kirilenko, Ramunas Siskauskas and Viktor Khyrapa in an attempt to put the team’s best defensive foot forward. Saras inbounds the ball well enough after Diamantidis manages to lose Vorontsevich momentarily. His spacing just a tad too far beyond the three-point arc hurt badly, however: Kirilenko – perhaps sussing that Sato was little more than a decoy, leaves his man underneath to double-team Diamantidis. When Kirilenko stumbles after colliding with his own teammate thus leaving Batiste briefly open for a potential open catch-and-shoot, DD makes the crucial mistake: Pump-faking and then beginning a drive, Diamantidis drew enough attention so that Batiste and Jasikevicius were only loosely covered – but Diamantidis’ response was to retreat. Though oddly out of position behind Diamantidis, Kaimakoglou was also wide open with Vorontsevich and Kirilenko committed to the ball-handler. Indeed, Kirilenko almost nearly shot past the playmaker. Unfortunately, at that particular point, DD’s back was to AK and so Diamantidis again reversed course in his increasingly claustrophobic space. The stand-still attitudes of Saras, Batiste and Sato appear to indicate that this was the positioning called for on this play: CSKA must have realized this as well, because by the time Diamantidis finally put the ball on the floor, Siskauskas, Shved and Khryapa, respectively, were now sticking tight to their men while allowing Kirilenko and Vorontsevich to smother the Green PG. Perhaps Kaimakoglou cut to the midway point between ball and basket just a half-second too slowly … perhaps Diamantidis feared the long reach of Kirilenko. In any case, ultimately the playmaker bounced a weak, too low (and undeflected) pass to Kaimakoglou. Even if the pass had been on target, BiE wonders if Kaimakoglou could have connected on the shot with Siskauskas already in position and Kirilenko rapidly switching to double. Saras in the corner might have been an option, though with another bounce pass seemingly necessary, the Lithuanian probably would not have gotten the potential buzzer-beater off in time. But that’s the problem, isn’t it? With the play firmly in the books, it’s all about speculation and conditionals now. As coach Zeljko Obradovic said in the post-game, a single play – even a game-ender – is mostly irrelevant: “We had 39 minutes and 52 seconds to win the game,” he stated flatly. Some will blame Diamantidis himself for the loss, others might blame Kaimakoglou for not handling the low ball, still others might cite a lack of movement from DD’s teammates … many will surely curse the referees for not calling a couple of intentional (if barely noticeable) fouls on Teodosic with 11-13 seconds on the clock. Again, though, it’s in the books. Panathinaikos goes home without the gold and Diamantidis will have to wait ‘til 2013 for Euroleague redemption. However, there will be said shot at redemption for the much-loved DD … and isn’t that really the great thing about professional sports? How do you say, “Wait ‘til next year!” in Greek, by the way…? While I agree that PAO had the rest of the game – “We had 39 minutes and 52 seconds to win the game”. What Obradovic couldn’t say for obvious reasons, is what happen during that period of time. And that is what happend, if you are patient enough to watch. While I hate talking about the refs – unfortunately the refereeing was terrible for a game of this importance… I am sure GG’s video has the last shot of Teodosic – were CSKA got the ball from outside after it hit off him… Some things were shockingly bad. What is even more weird is that CSKA was playing tough D, closed in on the paint but they only let PAO shoot 3 FT’s while CSKA shot 18 until the half. The refs were atrocious in the 4th quarter. It reminded me of watching Kings vs. Lakers in 2002. Panathinaikos was robbed. Panathinaikos was robbed on multiple occasions and with a 2 point margin in a semi-final game its makes European basketball look really weak.